Simply put, your tires are the only parts of your vehicle that actually make contact with the road – so proper inflation, tire rotations, keeping an eye on tread wear, and matching your tires to weather and road conditions are very important. Tires affect your vehicle’s handling, ride, and braking, and as such, it’s essential to make sure they have the correct air pressure, tread depth, balance, and alignment. WHEN SHOULD I BUY NEW TIRES? Making sure your tires are in optimal condition on a regular basis is an important step in protecting both your safety and the safety of your vehicle. In a perfect world, you should take a look at your tires about once a month. If you live in an area with a lot of potholes or other debris in the road, in an area with a cold climate (hi, Minnesota! ), or put an abnormally high number of miles on your vehicle, you should inspect your tires a bit more often. Improper air pressure in your tires can cause premature wear and tear, as well as impairing performance. Cold weather can cause tire pressure to decrease by about 1 PSI for every 10 degrees Fahrenheit the temperature drops, so be sure to check your tires more often during the winter months! It’s also worth noting that the proper PSI for your vehicle is located on the tire information decal inside the driver’s door or your owner’s manual – not the tires themselves. Rotating your tires regularly helps to prevent uneven wear on your tire tread. This is achieved by moving the wheels and tires from one position on the vehicle to another. The front tires will typically wear on the outside edges because of shifts in your vehicle’s weight when you turn, while the rear tires simply follow the fronts and wear more evenly. Regular rotations (every 6,000 to 8,000 miles) will add thousands of miles to the life of your tires, saving you time and money! Unfortunately, no matter how diligent you are about taking care of your tires, they will wear out eventually. 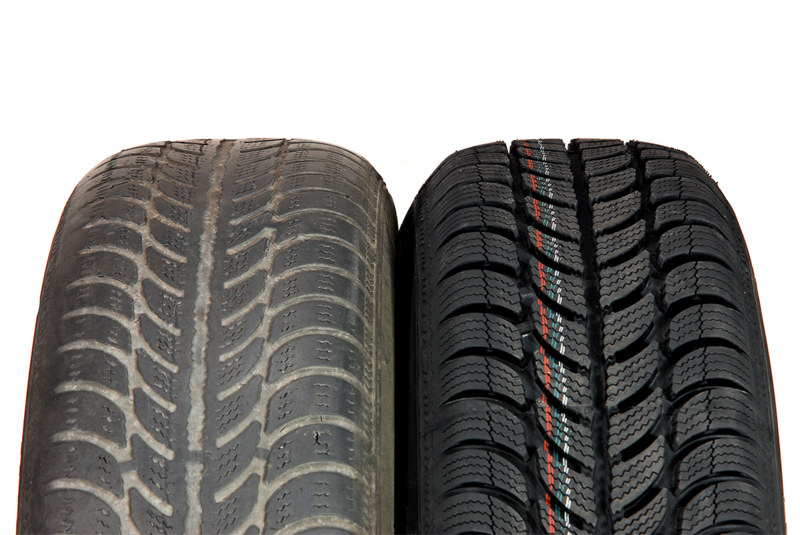 It’s recommended that you replace your tires every six years, regardless of tread wear. Of course, heavy use or inclement conditions can decrease tread depth long before the six-year mark, so keep a close eye on your tires and replace them when necessary – this is especially important in parts of the country that see heavy amounts of snow, ice, or rain during the winter months. Too much air in your tires will force excessive contact between the center of the tire and the road. This leads to undue wear and tear on the middle of the tread, with much less wear on the tires edges. Too little air in your tires will make the tire’s outer edges be the primary point of contact with the road, which will lead to undue wear and tear on both edges of the tread, while the center will be relatively unaffected. This usually happens when your wheels are out of alignment. This could mean your wheel is out of balance, or that the shock absorbers/other suspension components on your vehicle may need to be replaced. Both can be signs of an out-of-balance tire – one with the tread worn down to a flat spot from locking the wheels during a stop, or simply a tire with a separated belt. If you’re driving at a steady speed and your vehicle is pulling to one side, it could indicate an underinflated or damaged tire on the side of the car that’s being pulled towards. In some cases, this could also be caused by a brake issue or poor wheel alignment. Q: Do I really need winter tires? A: Winter tires are different from all-season and summer tires in several ways, the most important of which being the fact that winter tires are made from a special rubber compound that remains flexible and soft below 45 degrees. This leads to improved handling, traction, and braking in winter weather conditions. If you’re dealing with Minnesota or Wisconsin winters, winter tires are a wise investment. Q: How do I know if my tires are worn? It’s important to know that all tires wear out over time. When you see that the tread is even with the wear bars, or you do the penny test and see all of Lincoln’s head, you need new tires! If you’re not comfortable deciding for yourself, bring your vehicle in to Morrie’s! Q: How often should I replace my tires? A: It’s recommended that you replace your tires every six years, regardless of tread wear. Of course, heavy use or inclement conditions can decrease tread depth long before the six-year mark, so keep a close eye on your tires and replace them when necessary – this is especially important in parts of the country that see heavy amounts of snow, ice, or rain during the winter months. Q: How can tires help maximize my MPG? A: Proper inflation is key to even tread wear and maximized fuel economy. Check your tire pressure once a month, especially as temperatures change. Cold weather can cause a decrease in tire pressure, so be sure to keep your tires inflated to the factory recommended PSI, which can be found on the placard inside of your driver’s side door frame. Don’t forget the spare!